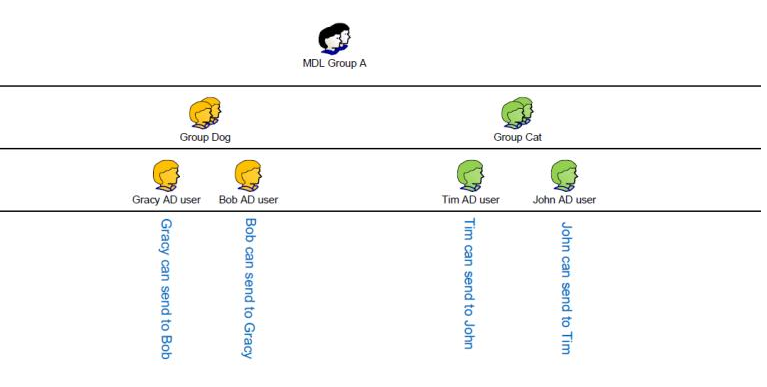 In the first example, the MassTransit Distribution List - "MDL Group A" contains two AD groups - "Group Dog" and "Group Cat". Each of the two groups has two members. The members of "Group Dog" can send files only to each other. The same is valid for the members of "Group Cat". For example: "Gracy AD user" can send files only to "Bob AD user". In the second example, the MassTransit Distribution List - "MDL Group A" contains two AD groups - "Group Dog" and "Group Cat" and two AD users - "Jake AD user" and "Rex AD user". These users can send files to each other, as well as to all users that are on child tree levels - the members of "Group Dog" and "Group Cat". The members of "Group Dog" can send files only to each other. The same is valid for the members of "Group Cat". For example: "Rex AD user" can send files to " Jake AD user", "Gracy AD user", "Bob AD user", "Tim AD user", and "John AD user". "Tim AD user" can send files only to "John AD user". In the third example, there is one additional AD group - "Group Snake" which belongs to "Group Dog". 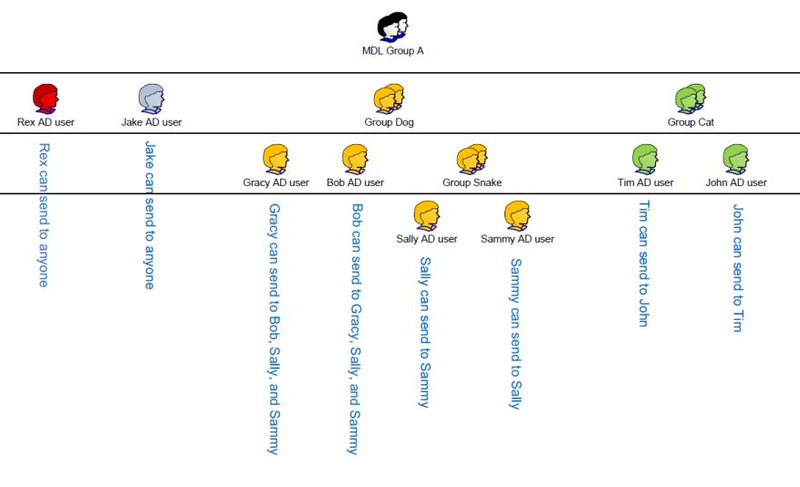 "Sammy AD user" and "Sally AD user" are on the lowest tree level of the MDL, so they can send files only to each other. In contrast of the previous example, users from "Group Dog" can send files not only to each other but to members of "Group Snake" as well, since it is also a member of "Grou Dog". "Rex AD user" and "Jake AD user" can send to all users. For example: "Bob AD user" can send files to "Gracy AD user", "Sammy AD user" and "Sally AD user". "Tim AD user" can send files only to "John AD user", since "Sammy AD user" and "Sally AD user" are not on a child tree level.